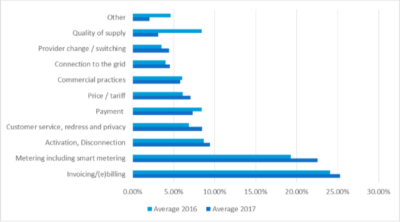 NEON, the association of independent, not-for-profit consumer dispute-resolution services and ombudsmen active in the energy sector, has published its annual report for the year 2017. While the number of complaints only increased slightly from last year, global decreases should not overshadow contrasted national situations on the ground. The aim of the NEON annual report is to provide not only a comprehensive overview of the activities of NEON but also of the activities of its members, based on members’ complaint data. This report should therefore allow policy makers and stakeholders to get a general overview of the main trends and issues affecting consumers in energy markets. In 2017 the number of complaints remained stable, with NEON members treating almost 90 000 disputes (for methodological reasons, this figure is not comparable to figures from previous years). As in previous years, most complaints related to invoicing and billing, followed by metering and meter-related issues. Slight decreases were observed in complaints related to payment problems and commercial practices, despite rising concerns related to misleading and unfair practices in doorstep-selling, especially in France and Belgium. The consolidated statistics are complemented with country-specific reports, which this year also feature specific information on the role of NEON members in national ADR systems.